3/12/2007 – Vladimir Klitschko is a Ukrainian IBF heavyweight world boxing champion with a PhD in sports science and an avid interest in chess. On Saturday he fought American challenger Ray Austin and dropped him with a flurry of left hooks 87 seconds into the second round. Next people hope to see a unification fight against WBC champion Nikolai Valuev. Watch Saturday's fight. Dr. Vladimir Vladimirowitsch Klitschko, who turns 31 in a two weeks, was born in Semipalatinsk, Kazakhstan, but is Ukrainian by nationality. He turned professional under the management of a Hamburg promotional company and lived in Germany for a period of time. In October 2000 he won the WBO Heavyweight Championship from American Chris Byrd in Cologne, Germany (Byrd had won the title from Vladimir's brother Vitaly six months earlier). Vladimir defended the title five time and lost it in an upset TKO to South African Corrie Sanders in March 2003. In April 2006 Klitschko again defeated Chris Byrd in Mannheim, Germany, for the IBF and the IBO world heavyweight championships. He went on to beat Calvin Brock in November 2006 at Madison Square Garden, and is now considered one of the finest heavyweight boxers in the world – the "man to beat" in the heavyweight division. His camp hopes for a unification fight against WBC champion Nikolai Valuev, Russia, who is 2.13 meter (7 foot) tall, and would be the first fighter Klitschko would look up to (Vladimir is 2.00 meter or 6' 7" in height). Valuev is managed by Don King and long, hard negotiations are expected. 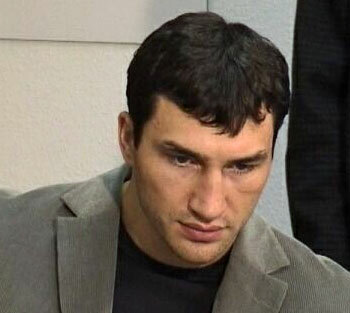 Today Vladimir, who speaks fluent German, lives in Beverly Hills, California, where he trains with his older brother, former heavyweight champion Vitali Klitschko. 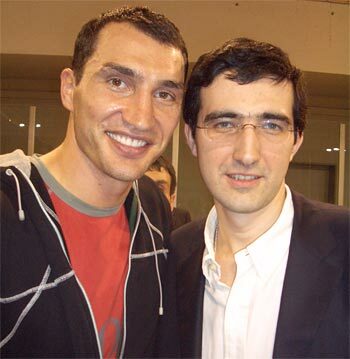 Both Klitschko brothers are avid chess players and have visited the ChessBase office in Hamburg.